Taking a one-post break from my short series, “The CIOs Best Friends,” BFFs who are critical in ensuring CIO effectiveness. Next time we cover the Vendor Account Executive – CIO relationship. What is your biggest dream? What’s been in your heart but never attempted? Fear keeps most people from pursuing their dreams, or even speaking about them. Three years ago, I completed my first Ironman. A physical feat for sure, but also lessons for work and play. Ironman accelerated my personal and professional growth and to this day serves as a vivid reminder that one can accomplish great things where dreams and fear are allowed to collide. I never thought I could be an Ironman until life events dictated otherwise. My manager actually envisioned me and encouraged me to pursue despite my fears. These videos explain the story for those interested. If you’ve followed me for any length of time, you know I view each of life’s parts as one continuous journey. I integrate all aspects of living in order to maximize time and opportunities. Crossover is key to accelerated and sustained growth. Here is what I learned and how it applies to our careers. Training. Many CIOs believe no further training is necessary once they’ve reached the top. To the contrary, requirements increase with elevation. Continually equip yourself or you’ll be passed along the way. Embrace change. During Ironman, a racer encounters unforeseen circumstances. Strong winds. High tides. Flat tires. No one is exempt from trials. Do you accept change and make the most of it, or do you spend energy fighting elements you cannot control? Adapt to curveballs thrown your way, and then thrive. Guts. It’s not merely the most fit who finish Ironman. It’s also those who want it badly. Crave it. I surpassed colleagues in my career who were brighter than I because they lacked fortitude, desire, and focus to push through challenges. Painful things will happen that tempt you to quit, so harness the power of passion, for passion creates guts and drives success. Bust boundaries. A 5K run was a long distance. Running a marathon struck me with fear. Today, however, 10K is a warm-up. Ironman busted boundaries I believed invincible. As CIO, we must continuously bust boundaries lest our organizations become complacent and visions dim. Test boundaries, then break through and grow to the next level. Planning. No one wakes up and decides to do Ironman that morning. It takes advanced planning and years of transformation to see grand dreams achieved. Plan similarly for your career and your organization. Proper preparation preludes proficient performance. No greater euphoria will seize you than crossing the finish line – a plan fully executed and realized. Rest and refueling. There is a science to Ironman, which includes rest and refueling. Continuous activity leads to burnout. Take time for nourishment and you sustain your energy. Constant action is not synonymous with effective action. Build in time for rest and refueling. Followership. Be sure the person you are following has the vision and stamina to keep you on the right track. Great leaders help you overcome fear. “Followership” is a critical talent for reaching dreams. Two are better than one. By riding in a pack, you gain 40 percent efficiencies over riding alone. Teams accomplish more. Pushing and pulling together, a team outperforms the loner. Surround yourself with positive people dedicated to your success. They will get you through the loneliness and pain of challenging times. First break all the rules. Sometimes you’ve got to shake things up and not do the same things over and over, especially if they’re not working. Focus on strengths not weaknesses. I made the choice to strengthen my strong bike over my weak swim, and it paid off. Bigger picture. As a leader, do you have a significant purpose? Put people first. Seek to serve. Dedicate your efforts to others. 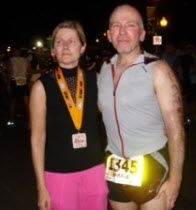 My Ironman was inspired by and dedicated to cancer victim Ellen. She kept me in the race. In health care, the Ellens are the ultimate endurance athletes running a race that nobody should ever have to run. We are there for them. An update for those who watched the videos. Ellen traded her earthly rags for a robe of righteousness on July 26, 2009. I will never forget the energy she gave me during my training and our time together at the finish line. She helped me overcome fear and reach my dream. My bike still bears her name. Pam is in complete remission. You can’t tell by his energy and attitude, but “Ironman” Sam is still fighting. 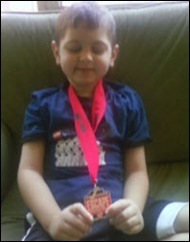 I hope to accompany Sam on his first triathlon this September. He will be 8 years old. I will help him overcome fear and fulfill a dream. I work in Mr. Marx org and am a fellow athlete and appreciate the stories that tie work and lifestyle together. My team had a celebration party at his home last year and I wanted to see all of his “bling” from his races. He has none. I wont spoil the reason but you should ask him. Ed thank you for always providing food for thought that stretches me to be better and for being inspiring. I don’t have a mentor but consider your articles a small mentor-ship program. A simple Analyst with big dreams. Ed – this was amazing. thank you for sharing your journey. I always love reading your articles, but as a triathlete myself, former Team in Training Tri Coach and someone living with a non-curable form of cancer for the last 20 years, you really blew my dress up this time. As I make my personal transition out of the corporate healthcare IT world and into a world serving long-term cancer survivors, I hope we have the chance to meet. You truly are an inspiration. Keep on rockin! Wow! What an inspiration. Thank you for sharing. We need more stories like this; stories that inspire and lift us up and tell us it’s possible. With all the bad news in the world, this was a ray of much needed sunshine. Another wonderful article Ed. Thanks for the inspiration! This was excellent. As a critic of some of your blogs before, I now have a overwhelming amount of respect for what you have done. Thanks for sharing this and inspiring us all! Highly inspirational – excellent way to showcase and encourage work life balance. This read was much appreciated! This was an awesome article Ed! Thank you for sharing your story! I’ll spill the beans. Ed’s “blings” (medals) went to the cancer victims as encouragement back to them to keep up the good race. The training and committment for the Ironman also applies to other dreams and aspirations in our lives. I work in the same organization as Mr. Marx, and appreciate his insights and inspirations. I aspire and dream of becoming a recognized artist is my chosen medium. The same principales Mr. Marx outlines, apply to whatever your dreams and goals may be. Each time I watch these videos I cry. Seeing people hurt make me cry more than I ever did during my Ironman.